The Ribble Valley is a wonderful place with outstanding fells, lush green valley’s and quaint market towns ideal for a getaway from the every day hustle and bustle of the cities. You can relax by the rivers, climb a hill or walk in the footsteps of Romans, Normans and literary masterminds who once set foot in this historic landscape and JRR Tolkien was one of them spending a lot of his time walking in the Ribble Valley while visiting his son at a Jesuit seminary, now part of Stonyhurst College. Tolkien wrote the drafts of his books here and is where he got his inspiration for his imaginary landscape for his books Lord of the Rings and The Hobbit. Hurst Green is a small village in the Ribble Valley in Lancashire situated close to the River Ribble near its junction with the River Hodder. The village had three shops which have closed down over the last few years but there are three pubs, a village hall and St. John’s church. The Baley Arms and the 17th century Shireburn Arms have rooms and cater for functions, weddings, parties and celebrations. There are also many B&B’s to accommodate the large number of visitors. The village is said to be haunted by the Highwayman, Ned King and his ghostly spectre has been seen on many occasions riding through the village late at night. Stonyhurst Hall situated just outside Hurst Green was founded by Richard Shireburn in 1592 and the family lived there for 200 years bringing development to the tiny hamlet and by the 20th century the village became the size it is today. In 1794 The Hall and estate was given to the Society of Jesus as a new home for their college. The College steeped in history is now one of Britain’s leading Catholic boarding schools. Shireburn donated the impressive and distinctive Alms Houses, in Avenue Road, to the village. The River Ribble of 75 miles runs through North Yorkshire and Lancashire from near the famous Ribblehead Viaduct to the Irish Sea between Lytham St. Annes and Southport. The main tributaries are the River Hodder, its largest tributary, and the Calder both of which join the river near Great Mitton. 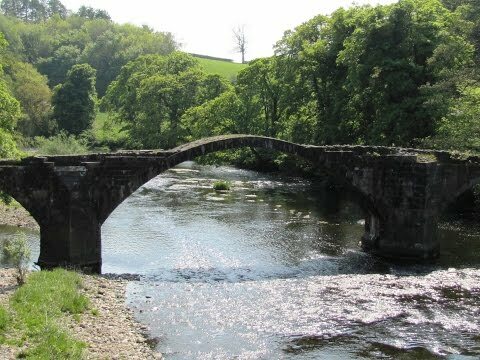 The River Hodder flows for 23 miles from White Hill to the River Ribble and collects many tributaries from the valleys of Bowland and parts of the Ribble Valley. The River Hodder runs close to Stoneyhurst College and is a County Biological Heritage Site. Cromwell’s Bridge a packhorse bridge which crosses the River Hodder is no longer in use and is named after Oliver Cromwell who marched his parliamentary army over the bridge on their way from Gisburn to where they fought the King’s men in the Battle of Preston in 1648. We park at the side of the road near the public toilets and walk through to the back of the Shireburn Arms car park and go through the gate. We follow the footpath downhill alongside the hedge on the right. We cross a little stream marked by a yellow arrow and keep heading downhill. We cross a stile on some decking boards and up some steps through the trees and follow the path and a sign for the Ribble Way to cross a bridge. We turn left at the River Ribble and follow the river on our right passing an arched bridge carry the aqueduct. We keep heading forwards and eventually come to a tarmac track near a small weir on the right. We follow the tarmac track for a short way before dropping back onto a grass path. We pass Jumbles on our left and another weir on our right. We then head forwards on a tarmac track a little distance from the river until we come to a cattle grid. We go through the gate at the side and walk across the field following the arrow back to the river side. We follow the river again and we can see Hacking Hall on the other side. The river soon splits the River Calder to the right and the River Ribble to the left. We keep following the River Ribble passing Mitton Wood on the other side. Soon the river splits again and we follow the River Hodder to the left. We pass through a farm following the track and arrows slightly uphill through the trees then just after passing Winckley Hall on our left and a large gate on our right we go through a small old rusty gate on the right next to a building. We cross straight over the field through the gate and straight over the next field to the wood. We keep the edge of the wood on our right and walk forwards we can see Stonyhurst College in the distance. We head down towards the road going through a gate and over a stile in the corner next to a pond. We cross the field and turn right on to the road. We follow the road downhill to Cromwell’s Bridge just for a look then retrace our steps back uphill taking the second footpath sign on the right just in front of an old water trough. We go through the gate and walk uphill through the field towards a building and then bearing to the left through the large trees to a sign post at a stile. We go over the stile and turn right along the road for about 700 yards and turn left to Hall Barn. We pass the college playgrounds on the right and head forwards to the right of the barns. At the end of the barn buildings we turn right on to a tarmac track and after passing the domed observatory the college is on the right we turn left at the way marked gate. We head forwards with a tree line on our right and at the red building on the left we head down to cross a little stream and head uphill alongside the trees to a gate. We go through the gate and head forwards through three fields. We pass some cottages to a lane at the top of Hurst Green then turn left at the road down into the village. This is an easy flat walk with good paths. Allow 3 hours. Approx 6 miles using OS map 287 West Pennine Moors. Hurst Green in the Ribble Valley near Clitheroe in Lancashire. From Skipton take the A59 towards Clitheroe. Take the A671 into Clitheroe and then the B6243 to Hurst Green. There is no car park but plenty of road side parking. There are public toilets in Hurst Green and for refreshments there are three pubs the Shireburn Arms, Bayley Arms and Eagle and Child. There are no shops.